Entries tagged with “Cheesery Shop”. Dalewood Fromage Estate Cheese from a pastured Jersey herd in the Winelands! I have driven past Dalewood Farm for many years on my way to and from Franschhoek, but had read that one could only enter by invitation. Yesterday a blackboard on the R45 invited me onto the farm, and the surprise Cheesery Shop, a Factory shop offering the cheese range at reduced prices to the public. 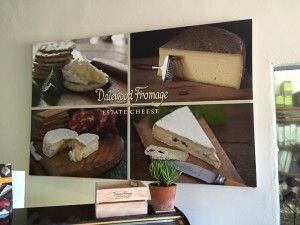 Dalewood Fromage is owned by Rob and Petrina Visser, who keep a very low profile. The Dalewood cheeses are made from Jersey milk from the farm’s own herd. Their pasture is bio-dynamically managed, and the herd is not treated with antibiotics air hormones. Dalewood cheeses do not contain preservatives, flavorants, or colourants.